I shall begin by referring to one of my masters, the great Marxist philosopher, Louis Althusser. For Althusser, the birth of Marxism was not a simple thing. It was composed of two revolutions, two major intellectual events. First, a scientific one. This event was Marx's creation of a science of history, the name of which is "historical materialism". The second event was of a philosophical nature. It was the creation, by Marx and others, of a new trend, the name of which is « dialectical materialism ». We can say that a new philosophy is required to clarify and assist the birth of a new science. Plato's philosophy was likewise required by the beginning of mathematics, or Kant's philosophy by the Newtonian physics. There is after all no difficulty in all of this. 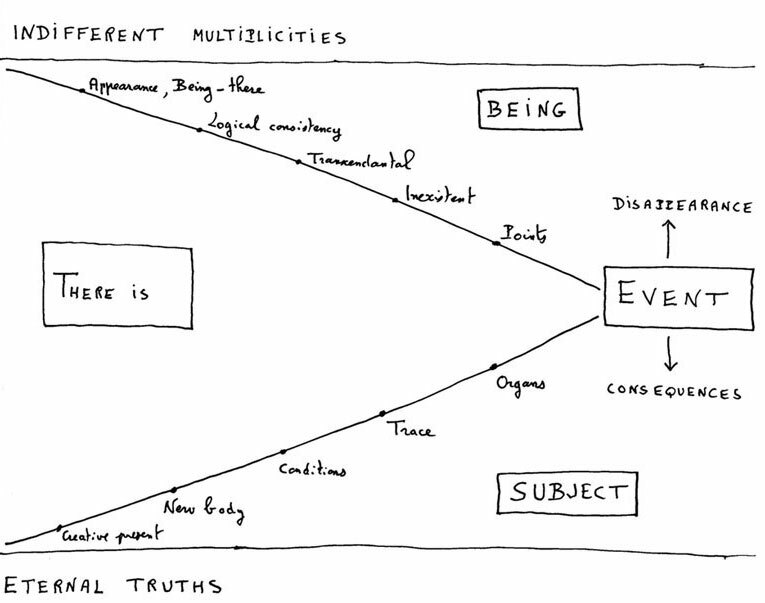 In this framework it is possible to say two things about the development of philosophy. 1. This development was dependent on new facts in some fields which are not immediately of a philosophical nature. Particularly on facts in the fields of science. Such as mathematics for Plato, Descartes or Leibniz, physics for Kant, Whitehead or Popper, history for Hegel or Marx, biology for Nietzsche, Bergson or Deleuze. As far as I am concerned, I quite agree that philosophy depends on some non- philosophical fields. And I have called these fields the "conditions" of philosophy. I would simply like to say that I do not limit the conditions of philosophy to the progress of science. I propose a much larger set of conditions, under four possible types: science, but also, politics, art, an love. So my own work depends, for instance, on a new mathematical concept of the infinite, but also on new forms of revolutionary politics, on the great poems of Mallarmé, Rimbaud, Pessoa, Mandelstam or Wallace Stevens, on the prose of Samuel Beckett, on the new ways of love which have emerged in the context of psychoanalysis and the complete transformation of all questions concerning sexuation and gender. It would therefore be possible for me to say that the development of philosophy is the gradual adaptation of philosophy to the change in its conditions. Then you could say : Philosophy is always behind! Philosophy is always trying to catch up with non- philosophical novelties! And I would have to say: correct! That was in fact Hegel's conclusion. Philosophy is the bird of wisdom, and the bird of wisdom is the owl. But the owl flies off only when the day is over. Philosophy is the discipline which comes after the day of knowledge, the day of experiences, at the beginning of the night. And apparently our problem, the problem of the development of philosophy, is solved. There are two cases. First case: a new morning of creative experiences in science, politics, art or love is coming. And we shall have a new evening for philosophy. Second case: our civilization is exhausted, and the only future we can imagine is a dark one, a future of perpetual dusk. So the future of philosophy will be its slow death, its slow death in the night. Philosophy will be reduced to what we can read at the beginning of a beautiful text by Samuel Beckett, Company: "A voice is speaking in the dark." A voice without meaning, without destination. And in fact, from Hegel and Auguste Comte to Nietzsche, Heidegger or Derrida, not to mention Wittgenstein and Carnap, we can find the philosophical idea of a probable death of philosophy, in any case in its classical form, the metaphysical one. I could stop my lecture here, and say with my hair standing straight up on my head like a singer in the Punk style: no future! After that we would all drink the alcohol of nihilism. But there remain some little difficulties. The first one, which is perhaps too formal, perhaps a sophistry, is that the idea of the end of philosophy has been a typical philosophical idea for a long time. Moreover, it is often a positive idea. For Hegel, philosophy is at its end because philosophy can finally understand what an absolute knowledge is. For Marx, philosophy as an interpretation of the world can be replaced by a concrete transformation of this same world. For Nietzsche, the negative abstraction of old philosophy has to be destroyed to liberate a true vital affirmation, a big "Yes!" to all that exists. And for the analytical current, metaphysical sentences, which are pure nonsense, have to be deconstructed in favor of clear propositions and arguments under the paradigm of modem logic. In all these cases we see that the great declarations concerning the death of philosophy in general, and of metaphysics in particular, are most probably a rhetorical means of introducing a new way, or a new goal, into philosophy itself. The best means of saying: I am a new philosopher, is probably to say: philosophy is finished, philosophy is dead. So I propose to begin something absolutely new. Not philosophy, but thinking! Not philosophy, but vital potency! Not philosophy, but a new rational language! In fact: not old philosophy, but my own new philosophy. So there is a possibility that the development of philosophy must always be in the form of resurrection. The old philosophy, like the old man, is dead, but this death is in fact the birth of the new man, the new philosopher. But as you know, there is a close relationship between resurrection and immortality, between the greatest change we can imagine, the change from death into life, and the most complete absence of change we can think of, when we are in the joy of salvation. Maybe the repetition of the theme of the end of metaphysics and the correlative repetitive theme of a new beginning of thinking is the sign of a fundamental immobility of philosophy as such. Maybe philosophy has to put its continuity, its repetitive nature in the form of the dramatic couple of death and birth. At this point we can return to the work of Louis Althusser. Because Althusser, who maintains that philosophy is dependent on science, also maintains something very strange, which is that philosophy has no history at all, that philosophy is always the same thing. In this case, the problem of the development of philosophy is an easy one: the future of philosophy is its past. It sounds nearly like a joke to see the great Marxist Althusser as the last defender of the old scholastic conception of a philosophia perennis, of philosophy as pure repetition of the same; philosophy in the Nietzchean style as an eternal return of the same. But what is this "same"? What is the sameness of the same, which returns in the a-historical destiny of philosophy? Behind this question we naturally find an old discussion about the true nature of philosophy. There are roughly two main tendencies. For the first one philosophy is essentially a reflexive knowledge. The knowledge of truth in theoretical fields, the knowledge of values in practical fields. We have to organize learning and the transmission of knowledge. And the appropriate form of philosophy is that of a school. The philosopher is a professor, like Kant, Hegel, Husserl, Heidegger and so many others., including myself, when you address me under the name of "Professor Badiou ". The second possibility is that philosophy is not really a knowledge, that it is neither theoretical nor practical. It lies in the direct transformation of a subject, it is a kind of radical conversion, a complete change of life. And consequently it is very near religion, but by exclusively rational means; very near love, but without the violent support of desire; very near political engagement, but without the constraint of a centralized organization; very near the potency of artistic creation, but without the physical means of art; very near scientific knowledge, but without the formalism of mathematics, and without the empirical and technical means of physics. For this second tendency philosophy is not by necessity a matter of school, learning, transmission and professors. It is a free address of anybody to everybody. Like Socrates speaking to young men in the streets of Athens; like Descartes writing letters to Princess Elizabeth ; like Jean-Jacques Rousseau writing his confessions ; or also the Nietzsche or the novels or Sartre plays; or like, if you forgive me for a narcissistic touch, my own novels and plays. The difference is that philosophy is no longer knowledge, or knowledge of knowledge. It is an action. One could say that what identifies philosophy is not the rules of a discourse, but the singularity of an act. It is this act that the enemies of Socrates called: "the corruption of young people ". And because of that, as you know, Socrates was sentenced to death. "To corrupt young people" is after all not a bad name for the philosophical act. If you properly understand "to corrupt". Here "to corrupt" means to teach the possibility of refusing any blind submission to established opinions. To corrupt is to give to young people some means of changing their minds about all social norms ; to corrupt is to substitute discussion and rational criticism for imitation, and even, if the question is a question of principles, to substitute revolt for obedience. But this revolt is neither spontaneous nor agressive inasmuch as it is a consequence of principles and rational critics. In the poems of the great trench poet Arthur Rimbaud we find the strange expression: "Logical Revolts". That is probably a good definition of the philosophical act. "Logical Revolts". It is not by chance that my friend, the very good philosopher Jacques Rancière created a very important magazine in the seventies, the title of which was precisely: "Logical Revolts". But if the very essence of philosophy is an active one, we can have a better understanding of the reason why, for Louis Althusser, there does not exist a real history of philosophy. In his own work Althusser himself proposes to say that the function of philosophy is to introduce a division into opinions. And more precisely, into opinions about scientific knowledge, or, more generally, into theoretical activities. What kind of division? Ultimately, the division between materialism and idealism. And since he was a Marxist, Althusser thought that materialism is the revolutionary framework for theoretical activities, and that idealism is the conservative one. So his final definition was: philosophy is like a political struggle in the theoretical field itself. First. The philosophical act is always in the form of a decision, a separation, a clear distinction. Between knowledge and opinion, between correct opinions and false opinions, between truth and falsity, between Good and Evil, between, wisdom and madness, and so on. Second. The philosophical act always has a normative dimension. The division is also a hierarchy. In the Marxist case materialism is the good term and idealism the bad term. But more generally, it always appears that the division of concepts or the division of experiences is in fact the act of imposing, perhaps, on young people, a new hierarchy. And negatively, the result of the act is the reversal of an established order, or of an old hierarchy. So we have effectively something invariant in philosophy, something like a compulsive repetition, or like the eternal return of the same. We can summarize this matrix, which is not unrelated to the notorious series of the Matrix movies. Philosophy is the act of reorganizing all theoretical and practical experiences, by proposing a new great normative division, which reverses an established intellectual order, and promotes new values beyond the common ones. The form of all this is a more or less free address to everybody, but first and foremost to young people, because a philosopher knows perfectly well that young people have to make decisions about their lives, and that they are often better disposed to accepting the risks of a Logical Revolt. All this explains why philosophy is in some sense always the same thing. Naturally, every philosopher thinks that his or her work is completely new. That's only human. And many historians of philosophy have introduced absolute ruptures. For instance, after Kant, classical metaphysics was said to be impossible. Or, after Wittgenstein, it was no longer possible to forget that the study of language is the core of philosophy. So we have a rationalist turn, a critical turn, a linguistic turn... But in fact, nothing in philosophy is irreversible. There is no absolute turn. Many philosophers can find today, in Plato or in Leibniz, some points which are for them more interesting, more active than similar points in Heidegger or Wittgenstein. It is because their own matrix is largely identical to that of Plato or Leibniz. The fact that philosophy is largely a repetition of its act clarifies the immanent affinities between philosophers. Deleuze with Leibniz and Spinoza; Sartre with Descartes and Hegel; Merleau-Ponty with Bergson and Aristotle ; I, myself, with Plato and Hegel; Slavoj Zizek with Kant and Schelling... And maybe, for almost three thousand years, everybody with everybody. But if the philosophical act is formally the same, and the return of the same, we have to take into account the change of the historical context. Because the act takes place under some conditions. When a philosopher proposes a new division and a new hierarchy for the experiences of his time, it is because a new intellectual creation, a new truth, has just appeared. It is in fact because, in his eyes, we have to assume the consequences of a new event in the real conditions of philosophy. For example, Plato proposed the division between the sensible and the intelligible under the condition of geometry and of a post-Pythagorean concept of number and measure. Hegel introduced history and becoming into the Absolute Idea, because of the striking novelty of the French revolution. Nietzsche developed a dialectical relationship between Greek tragedy and the birth of philosophy in the context of the tumultuous feeling caused by the discovery of Richard Wagner's musical drama. And Derrida transformed the classical approach of rigid metaphysical oppositions partly because of the growing and irreducible importance, in our experiences, of their female dimension. That's why we can speak finally of a creative repetition. There is something unchanging in the form of a gesture, a gesture of division. And there is, with the pressure of some events and their consequences, the necessity for transforming some aspects of the philosophical gesture. So we have a form, and we have the variable form of the unique form. That's why we clearly recognize philosophy and philosophers, despite their enormous differences and despite their violent conflicts. Kant said that the history of philosophy was a battlefield. Yes, it is so! But it is also the repetition of the same battle, on the same field. Perhaps a musical image may help. The development of philosophy is in the classical form of theme and variations. Repetition, the theme, and constant novelty, the variations. But both theme and variations come after some events in politics, art, science, love, events which provide the necessity for a new variation for the same theme. So we, philosophers, are working during the night, after the day of real becoming of a new truth. I am reminded of a beautiful poem of Wallace Stevens, Man carrying thing. Stevens writes: "We must endure our thoughts all night." Alas! That is the destiny of philosophers and philosophy. And Stevens continues: "Until the bright obvious stands motionless in cold." Yes, we hope, we believe, that one day, the "bright obvious" will "stand motionless". The "bright obvious" of the Idea will stand like a fixed star in the sky, "motionless in cold". It will be the final stage of philosophy, the absolute Idea, the complete revelation... But that will never happen. On the contrary, when something happens in the day of living truths, we have to repeat the philosophical act, and to create a new variation. So the future of philosophy is, like its past, a creative repetition. We must endure our thoughts all night forever. The philosopher is useful, because he or she has the task of observing the morning of a truth, and of interpreting this new truth over against old opinions. If « we must endure our thoughts all night», it is because we must correctly corrupt young people. When we feel that a truth-event interrupts the continuity of ordinary life, we have to say to others: "Wake up! The time of new thinking and acting is here!" But for that, we ourselves must be awake. We, philosophers, are not allowed to sleep. A philosopher is a poor night watchman.